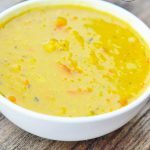 This clean eating carrot ginger red lentil soup is just the thing to warm your tummy on a chilly evening. A friend of mine, Lucy, is severely allergic to gluten, and I don’t mean just gluten intolerant, she will actually go into anaphylactic shock if she gets it into her system. Her throat closes up and everything. Scary stuff! It’s difficult for her to eat in restaurants because the table next to her inevitably has a basket of bread or a bun with their burger or a bowl of pasta, etc. And believe it or not, gluten can really hang in the air in a restaurant. It’s not fun on any level having that severe of an allergy. She’s also a fantastic cook. I’ve tried to convince her to start a food blog, but for various reasons, she hasn’t. So I talked her into sharing a recipe here instead, and I can tell you, we will all benefit from it! This recipe is crazy delicious! With the cooler months knocking at our doors, a good, tummy-warming, comfort-giving bowl of lentil soup is always a welcomed site. The smell of lentils cooking always feels like home to me. I grew up with a grandmother who cooked lentils on a regular basis and the best part was coming home to a large, steaming bowl on a rainy day after school. I walked home from school all the time, so when it rained, I inevitably came home drenched. Changing into dry clothes and then settling in for a bowl of comforting lentil soup will always be one of my fondest childhood memories. 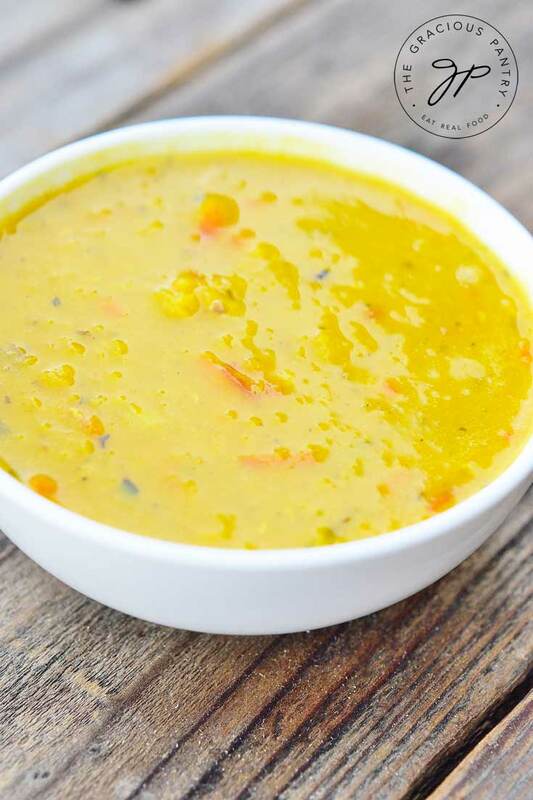 So when Lucy brought over a big container of this Clean Eating Carrot Ginger Red Lentil Soup, well… I just couldn’t resist blogging about it. It’s so delicious and the ginger is not overpowering at all. Just a light accent. Of course, if you prefer a heavier ginger flavor, feel free to add more! But for my taste buds, this was absolutely wonderful. This gluten free soup is as comforting as it is delicious. There's nothing like a warm bowl of soup on a chilly evening! Warm the olive oil in a large soup pot. Sauté the onions, garlic and tomatoes until they are cooked al dente. Cook on low to medium heat for approximately 40-50 minutes or until lentils and carrots are cooked through. If needed for consistency, add more water to get a good soupy texture. Cool slightly and serve with some whole grain garlic bread. Looks awesome especially with the colder months starting. Very comforting. This my kind of cold weather food. I have a carrot and ginger soup recipe…I’m adding this one to my Fall rotation. Thank you! Rachel – Awesome!! Please let me know how you like it! Mini Chef and I gobbled it up. It’s really comforting stuff! Tiffany, do you do something to prep the whole baby carrots before throwing them into the soup? I assume you could use big carrots and cut them into more manageable pieces? And last question, are these split red lentils or whole? Looking forward to trying this out! Erin – The baby carrots come prepped already, so I just dump them in. You could cut up larger carrots though. Just peeled and cut first. You can use either type of red lentil, but these were whole red lentils. Whatever you have on hand is fine. I think I would want to blend/puree this so it’s more of a cream style soup instead of having big carrot pieces in it. But sounds so yummy!! Just a little note….the recipe is intended for GF foodies, yet you suggest a nice whole grain garlic bread as an accompaniment–maybe suggest something else? GF Cornbread maybe? Thanks for all the great recipes!!! !